The shield device was used by the topographical engineers as a branch insignia until the branch was merged with the Corps of Engineers in 1863. The number of placement of stars can very on different original insignia. 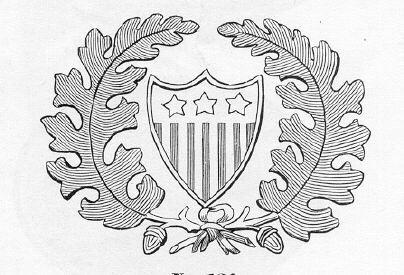 In 1872 the Adjutant General's Department adopted a similar insignia. This device consistantly has a large central star flanked by small stars in a triangular pattern that should not be confused with the various designs of shields used by topographical engineers.